An enthusiastic audience heard about the value of social pedagogy as an approach at the Social Pedagogy Professional Association (SPPA) launch on Tuesday 21st February 2017 at the British Academy in London. 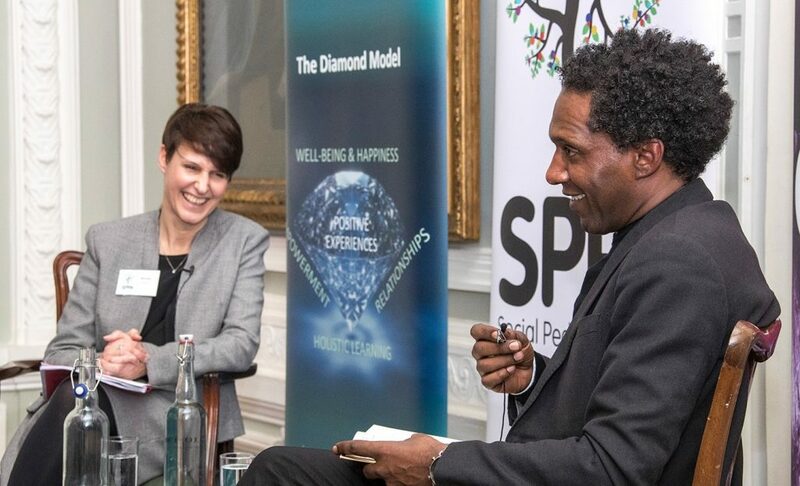 Lemn Sissay MBE, British Poet and Chancellor of Manchester University was interviewed by Prof Becky Francis, Director of UCL Institute of Education about social disadvantage and his experiences in care. Social pedagogy is a relationship-based approach to caring for children and families and is sometimes referred to as ‘education in the broadest sense’. It is based in an ethos that fosters equality and respect and values relationships, dialogue, joint activity and team work. The launch assessed the impact of social pedagogy in children’s services to date and discussed its future. During the launch, guest speakers from St Christopher’s Fellowship, and the London Borough of Hackney’s Virtual School for Looked-After Children shared their experiences of the positive impact of a social pedagogic approach to looked-after children, and their hopes for how social pedagogy will be adopted by more organisations in the future. Established by the Centre for Understanding Social Pedagogy at UCL Institute of Education, ThemPra and Jacaranda, SPPA is the professional home for social pedagogy in the UK. Since the 1990s, there has been interest in, research, delivery of training and development courses on social pedagogy in the UK. Now well over 2,000 people in the UK have had training in social pedagogy, in part through The Fostering Network’s Head, Heart, Hands Programme. Evaluations show that a social pedagogic framework for practice can transform care for young people. The legacy of this programme and the need to scale up social pedagogy in the UK led to the establishment of SPPA. SPPA’s vision is to build a world in which social pedagogy contributes to each person realising their potential. Its aims include developing excellence in and raising the profile of social pedagogy in the UK, building an active professional community for social pedagogy, and supporting the development of qualifications in social pedagogy – the Crossfields Levels 3 and 5 (in England) diplomas in social pedagogy. Gabriel Eichsteller, Director, ThemPra said: “Social pedagogy emphasises that relationships are central to all care and education. We’re not just talking about relationships between the professional and the people they support, but also about wider relationships in society, how we can facilitate social inclusion. Building authentic relationships that lead to a person feeling supported, able to trust and recognising their unique potential isn’t simply a natural skill though. It’s a finely honed art that benefits from greater theoretical understanding, ethical and analytical insights. This is what a qualification in social pedagogy can provide. Anyone interested to find out more about SPPA and SPPA membership should email sppa@ucl.ac.uk and join the SPPA mailing list. One year founding membership costs £70, and concessions for fulltime students and non-wage earners are available at £25. Group discounts available. Anyone interested to find out more about the social pedagogy qualifications should email Gulsh Khatun at g.khatun@ucl.ac.uk.